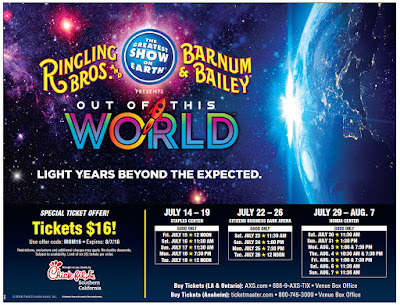 This July, Ringling Bros. and Barnum & Bailey®, the circus that started it all, invites fans to blast off on an intergalactic adventure with the launch of Ringling Bros. and Barnum & Bailey Presents Out Of This World™. 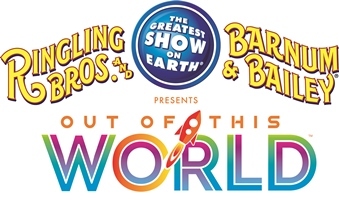 Feld Entertainment, Inc., the world’s leading producer of live family entertainment, today announced that this new, immersive experience will debut on the West Coast for the first time in the 145 year history of Ringling Bros., marking the Tour World Premiere at STAPLES Center in Los Angeles on Thursday, July 14, 2016; playing STAPLES Center July 14 – 19, followed by Citizens Business Bank Arena/Ontario from July 22 – 26 and rounding out the Southland engagement at the Honda Center/Anaheim from July 29 – August 7. Tickets for all California engagements are on sale to the general public are on sale now! “As we unveil Out Of This World, a show unlike anything experienced before, we are launching our iconic brand into the future,” said Alana Feld, Executive Vice President of Feld Entertainment and Producer of Out Of This World. “By adding the element of ice, we’re bringing speed and motion to an already thrilling, multi-sensory performance,” said Feld. “Throughout the show, families won’t know where the floor ends and the ice begins. We can not wait to bring you more news about this special Circus event! Follow Ringling Bros. & Barnum & Bailey on social media too & stay current on the latest developments on Facebook, Twitter, Instagram and YouTube — @RinglingBros. Tickets available for purchase online at Ticketmaster.com or HondaCenter.com, charge by phone at 800-745-3000 or in-person at the venue Box Office. 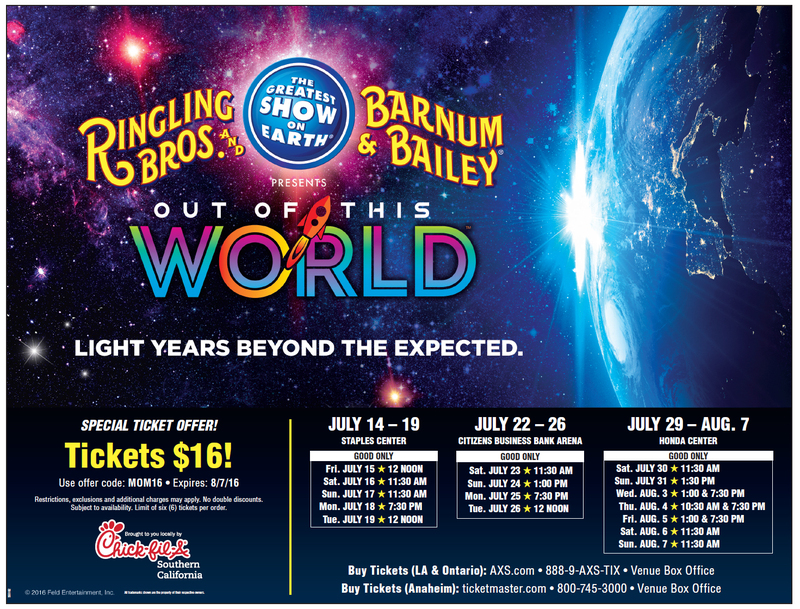 For a complete list of tour dates and locations through December 2016 and to purchase tickets, please visit the Ringling Bros. website (www.Ringling.com). Future tour dates will be announced at a later date.